A 12-year-old boy presented at our hospital with agitation, hyperactivity, and excessive talking approximately 3 h after ingesting 216 mg (5 mg/kg) of long-acting methylphenidate (MPH; Concerta®, Janssen Pharmaceutical K.K., Chiyoda, Tokyo, Japan) in a suicide attempt following an altercation with his mother. One month prior to presentation, he was diagnosed with attention deficit hyperactivity disorder (ADHD) at another clinic and prescribed 36 mg (0.83 mg/kg) of MPH once daily. Upon arrival at the hospital, his consciousness level on the Glasgow Coma Scale was 15, and his vital signs were as follows: blood pressure, 151/82 mmHg; pulse rate, 100 beats/min; respiration rate, 22 breaths/min; and body temperature, 36.7°C. Laboratory tests could not be conducted because the patient was extremely agitated and refused peripheral venous puncture. A 12-lead electrocardiogram (ECG) revealed prolonged QT interval with corrected QT intervals of 0.50 s [using the Bazett formula (QTc-B)] and 0.45 s [using the Fridericia formula (QTc-F)] (Fig. 1A). In addition, sinus tachycardia of 100 beats/min and mild left axis deviation in the limb leads were noted. 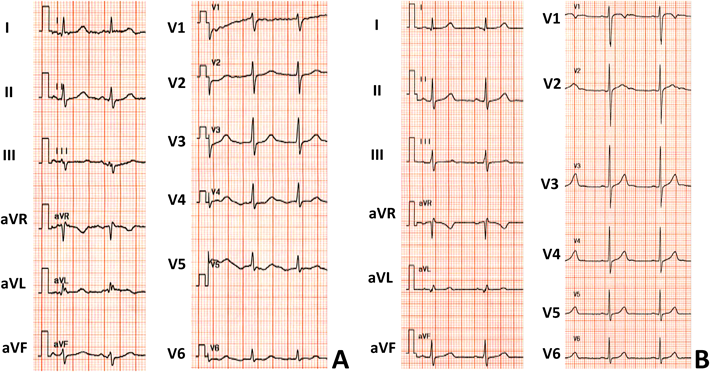 A school-based ECG screening program did not indicate any abnormality, and the patient had no personal or family history of paroxysmal palpitations or syncope. He was admitted to our hospital for observation and cardiac monitoring. The following day, he was discharged without any adverse event upon the disappearance of his symptoms. At discharge, both QTc-B and QTc-F were 0.42 s (Fig. 1B). Although increases in pulse rate and blood pressure in the present patient were primarily attributable to an overdose of MPH, the precise mechanism of QT interval prolongation remains unclear. Magnano et al. have reported that both epinephrine and isoproterenol can provoke not only tachycardia but also prolonged QT intervals and U-wave amplitude in healthy subjects2) and that the fusion of amplified U and T waves might contribute to apparent QT interval prolongation, although the mechanism of such catecholamine-induced U-wave amplifications remains unclear. In fact, ECG of the present patient at admission exhibited aberrant and broad T waves, suggesting the fusion of the U wave with the T wave following QT interval prolongation. Recently, the American Heart Association recommended careful evaluation and monitoring of patients with sudden cardiac death-related heart diseases including hypertrophic cardiomyopathy, long QT syndrome, Wolff–Parkinson–White syndrome, and Marfan syndrome, both before and after the initiation of treatment for ADHD.3) ECG is the most convenient and important tool for the evaluation of a patient’s cardiovascular condition. Considering the transient nature of ECG changes in our patient, cases of MPH overdose should be closely monitored on ECG even in the absence of serious cardiac disorders.